Mushrooms are an emerging niche crop with many benefits, including improving farmer stewardship of forested lands and the ability to offer a unique and highly desired product. With a bit of practice, mushrooms can be easily grown in the woods on many products that can be the surplus of healthy forest management. This course trains new and experienced farmers in the background, techniques, and economics of farm scale woodland mushroom production. Students will learn the basic biology of mushrooms, cultivation techniques for shiitake, oyster, lions mane, and stropharia mushrooms, proper conditions for fruiting, management needs, and harvesting and marketing mushrooms. Note: In addition to weekly online readings, presentation, and discussion, participants will receive spawn in the mail and get to try mini mushroom experiments at home. ALL LEVELS: The course is for new farmers, or experienced farmers seeking to diversify their operations. 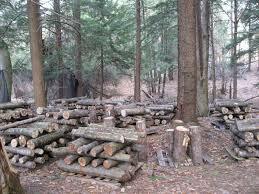 It’s also relevant to woodlot owners and backyard gardeners interested in this topic. Growing mushrooms as a viable economic enterprise will be stressed, though techniques can also be applied at the hobby scale. Mushroom farming is an easy topic for beginners with some experience farming and managing crop systems. Those with knowledge of forestry and chainsaw use may be able to move along more quickly. Tuesday Jan. 15 – Feb 19, 2019 with webinars on Tuesday evenings from 6:30 – 8:00pm Eastern time. Webinars are recorded for later viewing. Course full. It will next be offered in Jan 2020. Steve Gabriel, Agroforestry Specialist for Cornell Small Farms Program, co-owner of Wellspring Forest Farm, and co-author of Farming the Woods. Course full. It will next be offered in Jan 2020. Course fee is $280, which includes $30 for a table-top mushroom spawn kit that will be sent directly to you for the hands-on portion of the course. International students PLEASE NOTE: we can only ship mushroom kits to the 50 US states. If you are outside of the US, we welcome you to register for the course without the kit fee. Contact Erica at ejf5@cornell.edu to get a list of materials in the kit so you can try to source them from a supplier within your country. Register more than 1 month in advance to get a $25 discount on each course. NOTE: We are also offering other mushroom courses in-person which can be viewed at the Cornell Mushroom Event Page.